In 2015, two years from now, Australians and others around the world will celebrate the 800th anniversary of the Magna Carta, a document of rights which was forced upon King John of England on 15 June 1215. Previous kings had limited their own powers but in 1215, at Runnymede by the Thames River, a group of barons disgruntled by arbitrary authority forced the king’s hand. Many claims are made for the Magna Carta, or ‘Great Charter’, and some are not always accurate (such as the claim that the Charter advocated trial by jury) but there is no doubt that it eventually established the rule of law and that it influenced later great democratic uprisings, such as the revolutionary English civil war of the mid-seventeenth century. Essentially, it was about the notion that rulers, like everyone else, must be subject to the law of the land. The 1215 Magna Carta was soon betrayed by King John and was annulled by the Pope, Innocent III, a few months later. But the barons did not surrender their aspiration for the rule of law and in 1225, nine years after John’s death, a young King Henry III confirmed the Charter in modified form and passed it into law. In 1297 King Edward I reissued the Charter and it is this version that has endured. Over the next two centuries the Magna Carta was reconfirmed many times. Today, however, only a few of the Charter’s original 63 chapters remain on the statute books of the United Kingdom. These are clauses relating to the freedom of the English Church and confirmation of the ‘ancient liberties’ of the City of London and other cities, boroughs and towns. And, most importantly, chapter 29 (chapter 39 in the 1215 document) which asserts that ‘No free man shall be taken or imprisoned, or dispossessed or outlawed or exiled or in any way ruined, nor will we go or send against him except by the lawful judgement of his peers or by the law of the land’. From this chapter, rights such as habeas corpus, prohibition of torture, trial by jury, and the rule of law are derived. For visitors to, and staff of, the museum are some constant reminders of the ‘Great Charter’ in the environs around the building. Each morning when I drive to work, I park my car in a spot that runs off Langton Crescent. The street is named after Stephen Langton, the Archbishop of Canterbury, who sided with the rebel barons. Visitors to the building who go out into the beautiful Senate Rose Gardens sometimes continue their exploration and stroll through the Gardens western gate—’Magna Carta Gate’—into the attractive park called ‘Magna Carta Place’. The park features an impressive monument to the historic document. 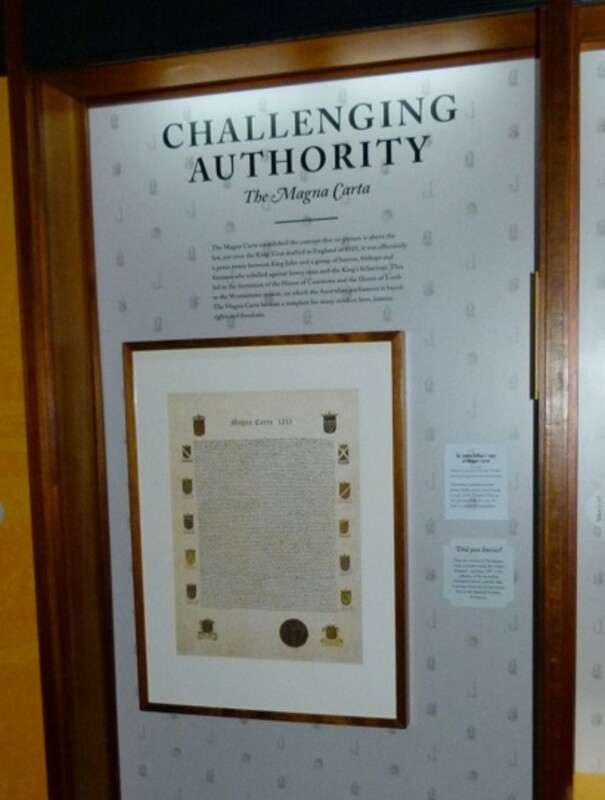 And a short distance away Australian Parliament House displays an original copy of the 1297 Magna Carta, one of only four in the world and Australia’s only copy. Its terms continue to underpin key constitutional doctrines; its flame continues to burn in the torches of modern human rights instruments; and its spirit continues to resonate throughout the law. The Australian Parliament has an online exhibition that provides further information on Magna Carta.